Natural and edible raw ingredients, safe to swallow. 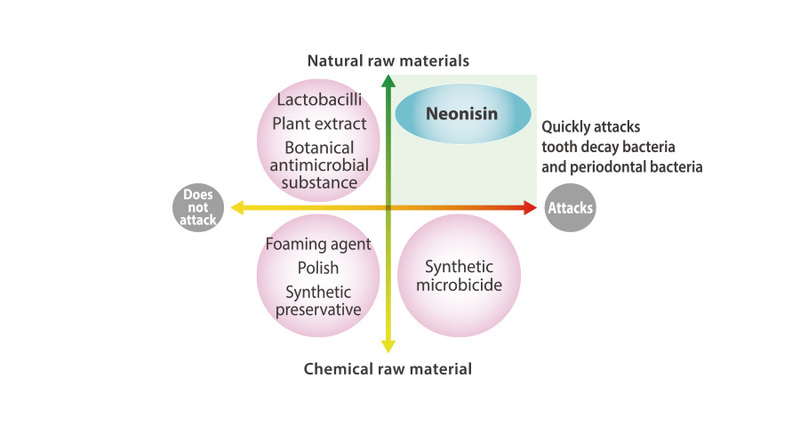 Naturally derived oral care ingredient "Neonisin®*"
“Neonisin-e®*” is a botanical lactobacillus-derived antimicrobial peptide (Bacteriocin) preparation developed through industry-university cooperation with Kyushu University Graduate School of Agriculture, Kagoshima University Graduate School of Medical and Dental Sciences, and the Department of Oral Disease Research, National Center for Geriatrics and Gerontology. It is a unique ingredient to ORALPEACE and was developed from nisin A, an antimicrobial substance safe for the human body that was discovered in cheese in 1928. 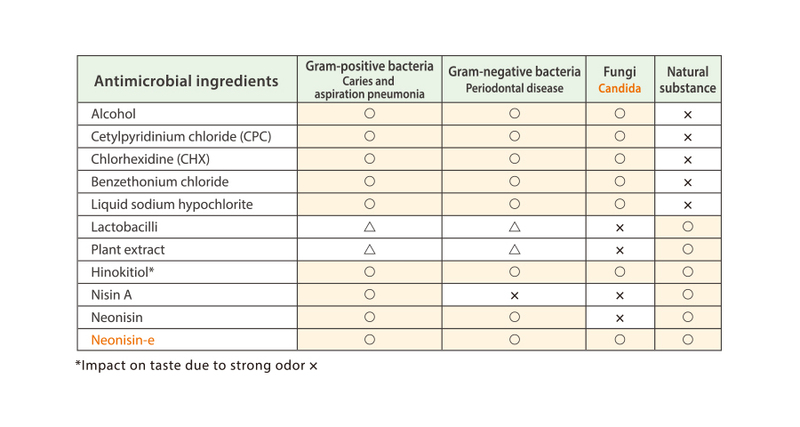 It shows excellent utility for tooth decay bacteria and periodontal bacteria causing intraoral problems, causative bacteria of bad breath, causative bacteria of aspiration pneumonia, and candida, and has been utilized as an oral care preparation. Bacteriocin is characteristically degraded/digested even after swallowing. ORALPEACE responds to our needs to easily conduct routine oral care with safe ingredients. 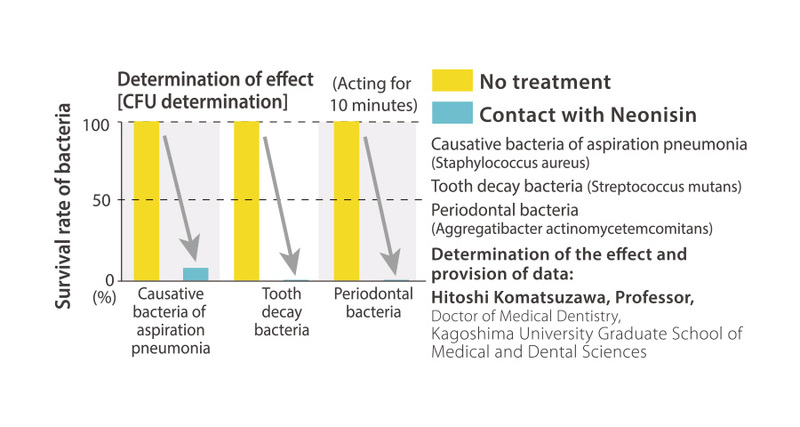 "Neonisin® effect experiment movie to oral bacteria"
Q.What is the difference between “Neonisin-e®*” and a synthetic bactericidal agent? 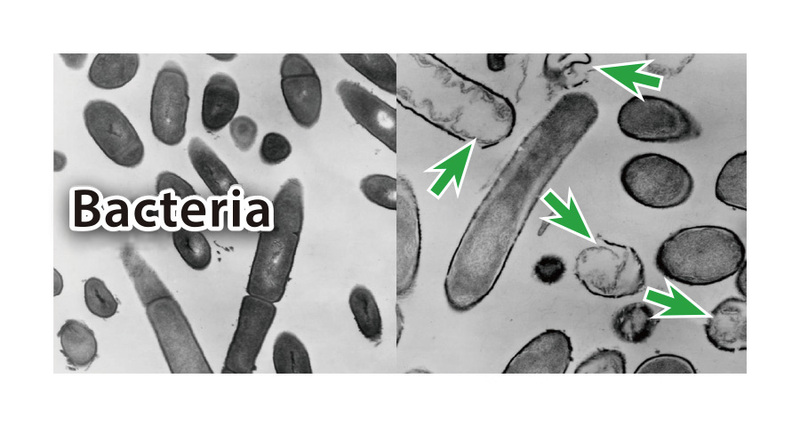 The synthetic bactericidal agents produced from petroleum and chemical raw materials have excellent antimicrobial properties, but there is concern if they are swallowed. Neonisin-e®* is a natural antimicrobial agent made from antimicrobial peptide (protein) produced by lactobacilli and botanical constituents. Even if it is swallowed by mistake, it will be degraded and digested in the gastrointestinal tract, it is gentle to the stomach and body. Q.What is the difference between “Neonisin-e®*” and living lactobacilli (probiotics)? Lactobacilli exert antimicrobial activity by producing antimicrobial substances themselves. Living lactobacilli (probiotics) produce antimicrobial substances such as hydrogen peroxide, aldehyde, bacteriocin (antimicrobial peptide), etc., but there are two large hurdles before producing an antimicrobial substance. The first hurdle is to fix the lactobacilli in the oral cavity, since they can be washed out easily with toothbrushing or beverages. The second hurdle is that lactobacilli may easily be affected by the environment in the oral cavity and the amount of the produced antimicrobial substance is unknown. Due to these hurdles, there is a problem with the expected effect of living lactobacilli. 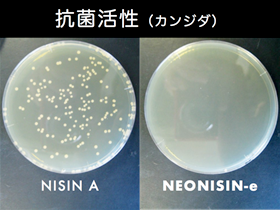 Concerning the case of bacteriocin, it is an antimicrobial substance produced from living lactobacilli, and although about 100 species have been discovered in the world, only nisin A was approved in Japan as a food additive after verification of its safety, and the other bacteriocins have not been approved. 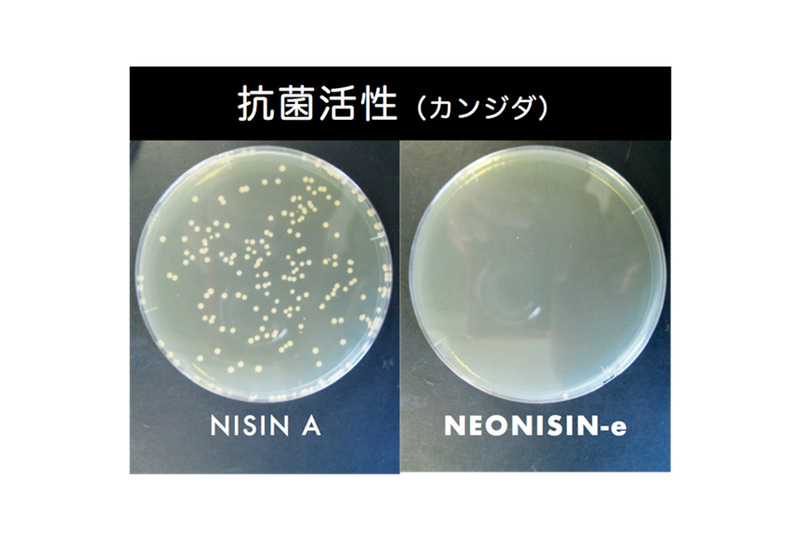 The antimicrobial substance that overcame all hurdles is “Neonisin-e®*.” “Neonisin-e®*” is a natural antimicrobial agent that is combined with botanical ingredients after high-degree purification of nisin A by a unique preparation method to increase the antimicrobial activity further. Its mechanism of action is to be adsorbed at the recognition site (lipid II) of the cell membrane of the target bacterium and to open pores in the bacterial cell membrane at once. Its characteristics are stability, instantaneity and safety.